The Central Committee of the Communist Party of the Philippines (CPP) has called on us all, to rally around the leadership and exert utmost revolutionary efforts, seizing every moment in our people�s war, to achieve a qualitative development of the revolutionary struggle. This is the call of the hour. At a time when US Imperialism and its European cohorts are facing grave economic and financial crisis, far worse than the Economic Depression of 1930s, our people�s war can seize this opportunity to all-sidedly intensify our struggle and bring the revolution to a new stage of qualitative development. � In strengthening the Party organization, while education on Party Courses is important, it is not the key task to best prepare our Party cadres to lead in the �Qualitative Leap.� Summing-up of our revolutionary efforts to draw lessons from of our rich experience is the best way to hone the capability for political leadership of our Party Committees at every level, especially at the lower levels of the Party. These summing-ups and their lessons should be integrated in the Party Courses to enhance the grasp of cadres of revolutionary theory and solidly strengthen their keenness in political leadership. The quality of Party education at the basic levels is in a sorry situation. Party members from the masses merely write down the Party theories in their notebooks as they are read out by instructors, without really knowing how they apply to real situations. � �Expanding the Party boldly� is not merely an organizational matter but more of a political one. The best base of recruitment for party membership is the militant people�s mass movement in both cities and countrysides, as accurately pinpointed by the anniversary statement. But, the quality of the people�s mass movement should be taken into consideration. Most of our mass struggles are hinged on national political and economic issues, which is inevitable to isolate the ruling clique. However, we have forgotten to balance it with the concrete day-to-day economic political issues where we could generate mass mobilizations in tens of thousands, develop mass activists in tenfolds and improve the people�s welfare in the course of our protracted struggle. This is the only way we could build party branches in more �local communities, factories, farms, transport lines, campuses, offices..� and expand the party boldly without allowing undesirables in. � The relationship of Party leadership and the mass members is also a key question in strengthening the Party. The leadership should have an accurate grasp of the situation and problems of members and promptly solve them to free our cadres and members from �baggages� and enable them to efficiently run the organizational machinery. This is what Comrade Mao said as, �sharing weal and woe� and �combining leadership with the masses.� Some exemplary regional and national cadres have shown fine practices on this and should be mentioned as genuine models in the style of proletarian leadership. On the other hand, we have to take serious steps in looking after the welfare of families of full-time cadres, especially the nutrition and education of their children. While it is true that some of our comrades of petty-bourgeois origins could send their children to private schools, many of our comrades� children especially in the countrysides could not even attend public schools for lack of daily resources. While our comrades in exile are splurging on comfortable and luxurious living and womanizing in The Netherlands, our comrades and their families in the rural villages are on hand-to-mouth daily survival. We should start practicing our socialist ideals within our party organization even in the course of our people�s war to ever-inspire our membership and the masses in this great revolutionary path, and prepare our own leadership for transparent and accountable governance in the eve of the final uprising. � Agrarian revolution is a key question in the �qualitative leap� of our protracted revolution. It is because our people�s war is mainly a peasant war and geared towards the immediate abolition of feudalism and semi-feudalism in the countryside. We cannot expand and consolidate our guerilla fronts and heighten our armed struggle without a corresponding emphasis on agrarian revolution. The general level of our agrarian revolution in our guerilla bases is still on land-rent reduction. We should programmatically raise it to full and absolute agrarian reform by confiscating the big land estates of despotic landlords and redistribute them to their tenants, farmworkers and other rural poor. By doing so, we fulfill a basic goal of our revolution and we expand the resource base of the revolutionary peasantry who mainly support the logistical needs of the people�s army. We should do away with secret-tactical deals with big powerful landlords, such as those in the Bondoc Peninsula, that put our revolutionary agrarian program under question by the peasants themselves and the public in general. We should also awaken to the fact that agrarian reform could both be pursued through armed revolutionary means in the guerilla fronts, and secondarily through legal means by improving and reforming the watered-down agrarian reform program created by the post-EDSA I people�s momentum. It is undeniable that many landless farmers have been benefitted by the legal land reform program, albeit without the equally necessary support services. The recent legitimate and just actions by different democratic farmers� organizations for the reform and extension of the legal agrarian reform program failed to gain the support of our comrades in the open parliamentary struggle. Worse than that, our open political leaders have put us to shame by tactically coalescing with big landlords in the parliament against this legitimate demand of the farmers� organizations. This should be immediately stopped if we want to win over the peasantry in their millions which will be an essential element in the �qualitative leap� of our people�s war. � Our conduct in the electoral and parliamentary struggle should support our efforts towards the �qualitative leap� of our people�s war. Our historical experience and reputation in this arena needs �cleansing� and reform. During the anti-Erap Estrada struggle, we opened a tactical alliance with Gloria Macapagal Arroyo (GMA), as a �less reactionary� element, and sustained this alliance until the 2004 elections where our open political leaders joined her in the ruling party�s �miting de abanse� in Makati. No less than our comrades in The Netherlands campaigned against voting for �movie actors� who popularly ran against GMA. This was in exchange for campaign funds in millions and the assurance of winning seats for our party list organizations in that elections. However, in less than a year�s time we had to shift fences to align with Erap, the United Opposition, and the widow of the �movie actor� we campaigned against, in the �Garci Tapes� electoral fraud scandal verus GMA. We tactically allied with the United Opposition as �less reactionaries� in consideration for millions in campaign funds and winning posts in the 2007 elections. 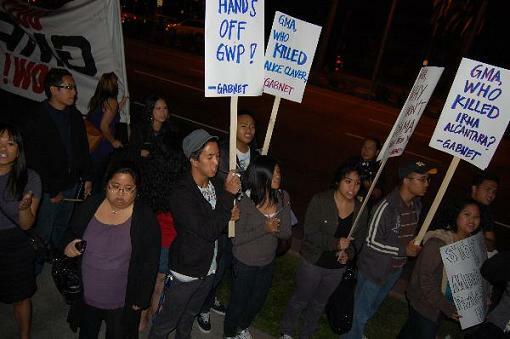 We joined the opposition in the campaign against graft and corruption of GMA whom we fully supported in 2001 and 2004. Now for 2010, we already have a secret-deal with a presidentiable popularly known as a real-estate magnate, who as early as now is embroiled in graft cases filed in the Senate. In the launching of the Makabayan Coalition, we invited other presidentiables and traditional party stalwarts, including the henchmen of Fidel Ramos who almost demolished the Party in the early 90s. Our conduct in the electoral parliamentary is still unfolding, but haven�t we noticed that we have not distinguished ourselves from the �TRAPOS� (traditional elite politicians) by playing their own dirty games in the parliamentary arena? Aren�t we confusing the masses and our own membership with these �horse-tradings�? Aren�t our leaders concerned with our own integrity as a Party of the revolution and social liberation? We finally extended recognition to the Anti-imperialist governments and peoples of Venezuela, Brazil, Ecuador and the other South American peoples in the Bolivarian Movement who won and continue to launch parliamentary struggle as their main form of struggle in complementation with other extra-constitutional forms. We are also studying the Nepalese national democratic revolution that �topped� their armed struggle with a parliamentary victory. But these models of people�s revolutions conducted parliamentary struggle with integrity and consistency with their revolutionary principles. They never relied on dirty deals with �less reactionary� elites but rather on very militant people�s movements who hewed an independent political path in their parliamentary struggles. When we say, �we should learn from these experiences,� we should be honest enough to adopt their principled way and conduct of electoral-parliamentary and be consistent with our proletarian principles. � Our United front work is still sectarian and exclusivist. We build our National Democratic Front (NDF) as an alliance between the Party and national democratic organizations controlled by the Party. It is essentially an �incestuous� relationship, allying ourselves with ourselves. It may sound ridiculous but it is true. Is there a single principal leader of the NDF who is not a member of the Party? Even the NDF consultants who gain the title after being arrested by the enemy are all leading regional or national Party cadres. How can we achieve a qualitative leap when we have not even improved the quality of the NDF as a united front organization? When Comrade Mao said, �unite the many defeat the few,� he meant consolidating the subjective forces and really winning over the middle political forces as basis for isolating the die-hards and splitting the reactionaries. His revolutionary party developed alliances with enlightened gentries, former warlords and even within the Koumintang Party and armed forces. The Nicaraguan revolution in the 80s won only after the unification of the three major Marxist revolutionary factions and the other smaller leftist groups including Maoists and Trotskyists in a broad left united front and program of struggle, which in turn, won-over the social elites who were out of power, in a determined fight to oust the Somoza dictatorship. The recent Nepalese victory was not won without the united Marxist unity that jointly welded a unified program of struggle. We have to build the NDF as a true united front of national democratic parties and organizations unified in a common program for national democratic liberation, that encourages the independence and initiatives of all participating organizations, that reaches out to the people in their millions. Otherwise, the quality of our revolution will not leap as we want it to. Comrades, a qualitative leap occurs only after an accumulation of quantitative advances. We have to develop our revolutionary work and organization determinedly and whole-sidedly to make it achieve a qualitative leap. The golden chance is here with us. It is up to us right now to seize this moment, reform our style of work and advance the revolution to a next higher stage towards winning victory for our people.